Once harvested some types of fruits that have been grown on trees can be stored successfully for for several months if they are stored in the right conditions. Apples and pears are particularly well suited for storage over winter. The key to successful storage of fruit is to choose unblemished fruit and then, once stored, checking them regularly for any damaged or deteriorating or diseased fruits and removing them - one bad apple or pear can ruin the whole lot. Storing your fruit in a dry, well-ventilated place will help to prevent it from rotting. Store your crop in shallow wooden crates or cardboard boxes. Wrap each individual fruit in tissue paper or old newspaper and place in a single layer in your box or crate. If you stack boxes or crates make sure that air can circulate easily between the levels. It is important to harvest fruit from the fruit trees in your garden at the right time. If you pick the fruit too early the flavour may not be fully developed, but if you leave harvesting too late the storage quality will be poor. The ripening period mostly depends on the type of fruit and cultivar. Howevr other factors such as regional climate, rootstock, aspect and poor weather can all affect fruit and the time to harvest it. Apples and pears ripen from late summer to mid to late autumn. Hold a fruit in the palm of the hand and, without finger pressure, lift the fruit slightly and gently twist it. If ripe, the fruit should come away from the spur with the stalk intact. Next, try a taste test: apples should be firm, sweet and crunchy and pears hard but sweet. If sound fruit starts falling from the tree (windfalls) it is usually fully ripe. Apples can also be assessed for ripeness by seed colour: these gradually turn from white to brown - cut a fruit in half to observe the colurs of the seeds. 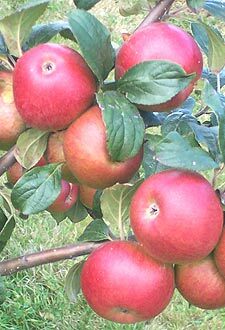 Late cultivars should be picked when the seeds are still yellow, a mid-season apple's seed should be brown. STORING FRUITS OVER WINTER ? Later maturing fruits usually keep for longer in storage. Store below 7°c (45°F) for apples, ideally at 2.7—4.5°c (37—40°F) in a cellar or garage, pears even a little cooler (but above freezing). Let plums fully ripen on the tree (midsummer to early/mid-autumn, depending on cultivar). Plums should feel soft when squeezed. Gather plums as they ripen and eat at once or refrigerate briefly. 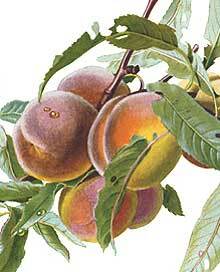 Peaches, nectarines and apricots should be gathered when ripe or almost ripe (Mid to late summer). Hold the fruit in your palm and gently press near the stalk with fingertips. The fruit is ready if it feels soft to the touch and will part from the tree with ease. Handle peaches, nectarines and apricots very gently and eat immediately, or store briefly in a cool place. These fruits also make excellent jams and conserves!